When you have pears that are not fully ripe, this is the perfect dessert to make: the pears will turn soft as they are poached and become lovely and juicy. Top them with some smooth mint chocolate sauce and you’ll have a wonderful, yet super-easy-to-make, dessert. 1. Pour the juice into a saucepan. 2. Cut a thin slice off the bottoms of the pears. Remove any seeds from the bottom. Peel the pears, leaving on the stalks, and put them into the saucepan. 3. Bring the poaching liquid to the boil and then simmer the pears under a lid on a gentle heat for 10 minutes. Take off the heat and set aside. 4. To make the sauce, put the chocolate, cream and xylitol into a small saucepan. Gently heat to melt the chocolate and combine the ingredients. Stir constantly. 5. 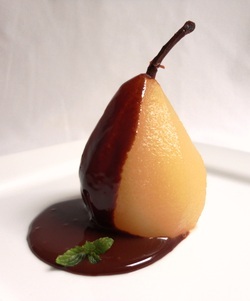 Place the pears on serving plates and spoon some mint chocolate sauce over them. If you don’t tolerate lactose, use lactose-free cream instead of ordinary cream. Serve hot or cold, and add some vanilla cream for extra yumminess. Have the leftover pears for breakfast with some natural yogurt or muesli.